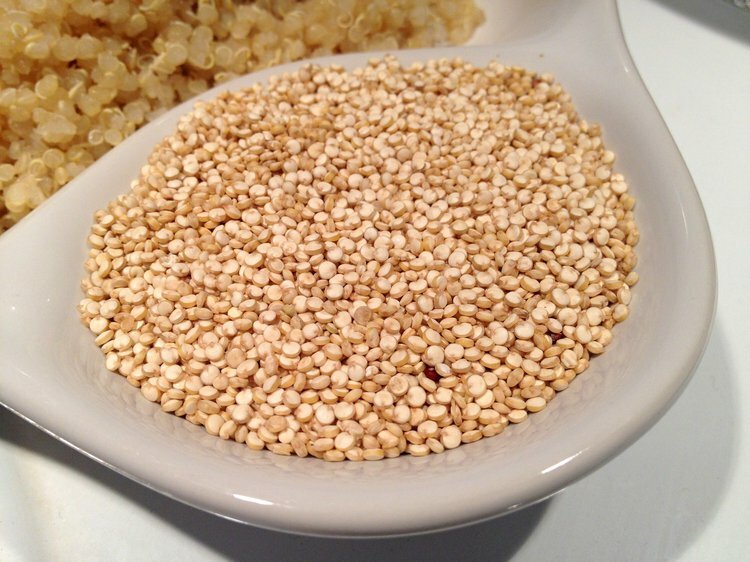 Quinoa is a wheat-free pseudo-cereal crop grown primarily for its edible seeds. Quinoa is among the least allergenic of all grains, making it a fantastic wheat-free choice. Quinoa is a wheat-free pseudo-cereal crop grown primarily for its edible seeds. Cultivation of quinoa dates back three to four thousand years ago when the Incas first realized that the seed was fit for human consumption. There are three types of quinoa: White, red, and black. Quinoa forms the staple diet of individuals in countries like Peru, Chile, and Bolivia. So you may wonder, is quinoa good for you? Quinoa is among the least allergenic of all grains, making it a fantastic wheat-free choice. Like buckwheat, this is one of only a few plant foods that are considered a complete protein that consists of all essential amino acids. There are also many associated health benefits of quinoa that have been observed. In terms of quinoa nutrition, this high-protein food is also an excellent source of fiber. One hundred grams of quinoa contains between 10-16 grams of dietary fiber. The dietary fiber in quinoa could help improve an individual’s digestive health by preventing constipation and promoting the removal of potentially harmful biological waste products. The high fiber content can help individuals maintain a healthy blood sugar level, especially in those who have diabetes. The National Health and Nutrition Examination Survey proposes that eating quinoa may be associated with a better quality diet, reduced intake of added sugars, and a lower body weight and body mass index. It has been said that quinoa may shrink the risk of diabetes, stroke, and coronary artery disease because quinoa can help improve blood sugar levels and decrease the amount of “bad” cholesterol in one’s body. Quinoa consumption is linked with a reduced risk of metabolic syndrome, which is a combination of conditions. Individuals diagnosed with metabolic syndrome have three out of the following five conditions: Abdominal (central) obesity, high blood pressure, elevated fasting plasma glucose, high serum triglycerides, and low high-density cholesterol (HDL or “good cholesterol”) levels. Quinoa also helps the body produce healthy red blood cells that carry oxygen to the body cells. Better blood flow indicates that our brains can function better since the brain requires about 20% of the blood oxygen. Another mineral that quinoa contains is magnesium, which can help relax blood vessels and alleviate migraines. The role of magnesium in enhancing the quality, length, and calmness of sleep is well identified. It is possible that magnesium helps reduce sleep disorders and the chance of insomnia by regulating the metabolism. Quinoa is loaded with antioxidants too. Antioxidants are compounds that neutralize cancer-causing substances, called free radicals, and are believed to help fight the aging process and many other diseases. Quinoa has an excellent nutty flavor, and it can cook in less than 20 minutes. It can be a great alternative to pasta or rice for a quick meal. The protein and dietary fiber content in quinoa makes it a great choice for those who want to avoid meat. Alvarez-Jubete, L., Wijngaard, H., Arendt, E. K., & Gallagher, E. (2010). Polyphenol composition and< i> in vitro</i> antioxidant activity of amaranth, quinoa buckwheat and wheat as affected by sprouting and baking. Food Chemistry, 119(2), 770-778. Jenkins, D., Wolever, T., Rao, A. V., Hegele, R. A., Mitchell, S. J., Ransom, T., ... & Wursch, P. (1993). Effect on blood lipids of very high intakes of fiber in diets low in saturated fat and cholesterol. New England Journal of Medicine,329(1), 21-26. Ranilla, L. G., Apostolidis, E., Genovese, M. I., Lajolo, F. M., & Shetty, K. (2009). Evaluation of indigenous grains from the Peruvian Andean region for antidiabetes and antihypertension potential using in vitro methods. Journal of medicinal food, 12(4), 704-713. Repo-Carrasco-Valencia, R. A. M., & Serna, L. A. (2011). Quinoa (Chenopodium quinoa, Willd.) as a source of dietary fiber and other functional components. Food Science and Technology (Campinas), 31(1), 225-230. Thompson, T. (2001). Case problem: questions regarding the acceptability of buckwheat, amaranth, quinoa, and oats from a patient with celiac disease.Journal of the Academy of Nutrition and Dietetics, 101(5), 586. Zhu, N., Sheng, S., Li, D., LaVoie, E. J., Karwe, M. V., Rosen, R. T., & HO, C. T. (2001). Antioxidative flavonoid glycosides from quinoa seeds (Chenopodium quinoa Willd). Journal of Food Lipids, 8(1), 37-44. San Martín, R., Ndjoko, K., & Hostettmann, K. (2008). Novel molluscicide against Pomacea canaliculata based on quinoa (Chenopodium quinoa) saponins. Crop Protection, 27(3), 310-319. Watanabe, K., Ibuki, A., Chen, Y. C., Kawamura, Y., & Mitsunaga, T. (2003). Composition of quinoa protein fractions. JOURNAL-JAPANESE SOCIETY OF FOOD SCIENCE AND TECHNOLOGY, 50(11), 546-549.